What is that which is soft and round but keeps you warm all through winter but cool in months of summer? For the nomadic folks that live in parts of Central Asia, the simple answer is… a yurt! From the rolling steppes of the nations of Kazakhstan and Mongolia to the towering mountains and vast valleys of Kyrgyzstan, the yurt was once the most common traditional dwelling in sight. Yurts are ultra lightweight, easy to take apart and equally easy to assemble. Nonetheless, they are strong and comfortable during hot seasons of summers and the cold windy winters months. 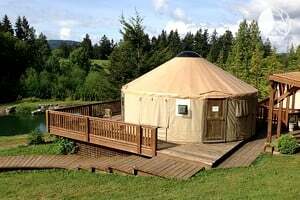 Yurts may be grayish-brown, gray, or bright white (often due to special coverings), it all depends on the color of the sheep wool used in building it. The yurts of Kazakh and Kirghiz are often decorated in a special local design using soft wool dyed deeply in bright colors that portray a ram’s horn. Although both the rich and poor people can afford to own a yurt in this region, it is the design that tells the difference. In the past, for example, wealthy and prestigious families decorated their yurts elaborately with beautiful blankets and expensive felt ﬂoor coverings and deep rugs to stand out from the masses. The most important part of the yurt is the center or central ring, also called a wheel. It is to this ring that all the poles of the roof are connected. This strong, heavy metal ring is what really gives stability and strength to the entire structure and it is situated right in the middle of the roof. A felt ﬂap is used to cover the opening of the ring and can be thrown back to provide nice ventilation if need be. In times of bad weather, such as rains, the flap is closed tightly and sealed. On clear nights, if need be, families can throw back that felt ﬂap on the roof and have the beautiful starry heavens spread out above them. Talk about slide away roofs! The people that dwell in certain rural parts of Central Asia still stick to a nomadic way of life; particularly in countries such as Kazakhstan, Mongolia, and Kyrgyzstan. In these lands, beasts of burden are still very much in use as a means of transportation. In Mongolia for example, the normal way to move a yurt is by camel. In the book, The Yurt, author George Kennedy gives an eloquent account of this movement while on a visit to the lands of Central Asia. Mongolian yurts, by tradition and design, have straight poles, lower and ﬂatter roofs than the yurts in other lands. This strange design actually helps the structures withstand the worst weather conditions out on the open plains of the steppes including strong winds and direct strikes of lightning on the open plains of steppes. The entrance of a yurt is normally positioned so it faces the rising sun directly, allowing sunlight to enter. Inside, all kinds of beautifully decorated felt rugs and sleeping blankets are folded up and arranged on wooden chests directly opposite the entrance. By tradition, an honored guest or the male head of the family sits in front of this colorful array, facing the entrance. The space to the right side of the entrance inside the yurt is strictly for the women, wife, and daughters. All the instruments for cooking, washing, cleaning, sewing, and felt making or dying are kept here. On the other side is space for men. Saddles, rifles, knifes, riding whips, and other equipment for game hunting and taking care of the animals they keep are kept there. In truth, the space within a yurt is very small and so if an entire family is to live in there, day after day, for years and decades as is normally the case, they need to be well organized and this the people have learned since ancient times. The primitive lifestyle of the nomads of Central Asia took a dramatic turn when, in 1917, the Communist Revolution brought the Russians marching down south into their lands. The Russians built roads, schools and hospitals throughout Central Asia, introducing a more settled lifestyle. Over time, a lot of the native peoples in the region abandoned their nomadic way of life to live permanently in the villages and towns. Nonetheless, a lot of shepherds who stayed put on the plains, now turned into vast collective ranches, caring for sheep, goats, cows, camels and horses, stuck with the traditional yurt as homes. In the book, The Yurt, George Kennedy gives an account of an encounter with a Kirghiz shepherd in his late 30s and the man’s narration of his boyhood life on the plains. “As a boy,” recalls the shepherd, whose name was given as Maksat. “I helped my father look after the herd of sheep in his charge. By July, when the cold and snow go away and the passes are open, we would drive our animals out to the high mountain plains to pasture. Like his father and grandfather before him, Maksat is a shepherd too and the open plains are his home. He lives in a nice yurt with his wife, son, and mother. So it is clear that the yurt still has a place in the modern societies of Central Asia. In lands such as Kyrgyzstan, it is quite common to see yurts set up along the roadside and highways. These structures are used as everything from stores and kiosks where people buy and sell things to cafes and restaurants where visitors can sit for a local meal or get a drink. Interestingly, they are also used as offices. Want a real taste of the traditional Kirghiz nomadic lifestyle out on the lonely cold plains of Central Asia? No problem! 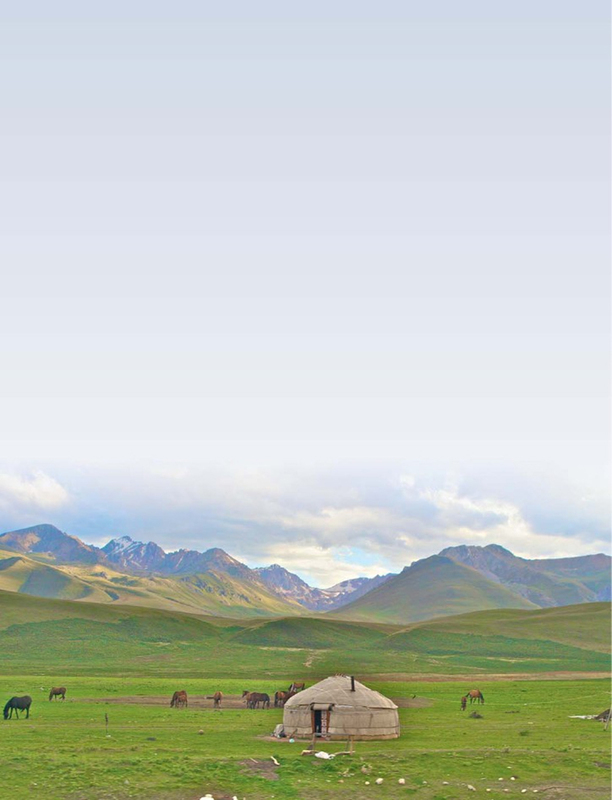 Certain agencies in the region offer the opportunity for visitors to spend a night or two in a yurt on the plains or in the mountains of Kyrgyzstan. Yurts are also still used in many traditional Central Asian funeral customs. Even in death, the nomads do not leave their yurt, so the saying goes. Yurts can be one story buildings as well. 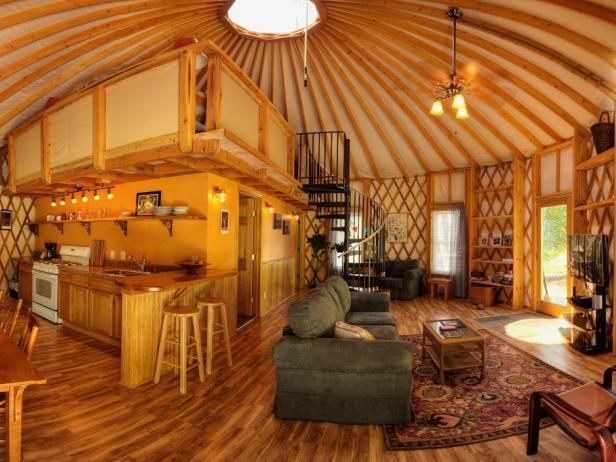 In recent decades, the yurt has made its debut in Western lands. There are people promoting it as a down-to-earth and less destructive solution for the environment. However, the modern yurts on offer in this sector are very diﬀerent from the traditional ones built in earlier times and still in existence in many parts of Central Asia. To build these new yurts, high-tech materials are used, and they are almost always permanent structures. While the true origin of the yurts of Central Asia cannot be determined with finality, the priceless value of these mobile structures is beyond doubt. The yurt will always retain its place in those lands, firmly rooted in the spirits of the nomadic people of Central Asia. An enduring testament to an age-old tradition that is rich with history. This book is the origin of this article. This article was pulled from the book, The Yurt by George Kennedy.